To become a certified lifeguard or pool operator, you will need to pass a swimming test, which includes: swimming 500 yards (approximately 480 meters); surface diving to a depth of 7 – 10 feet (approx. 2.1 – 3 meters); and retrieving a 10 pound object (approx. 4.5 kilograms) and returning it to the surface. 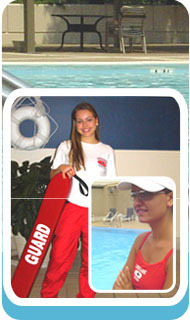 Participation in a lifeguard training course is required as well, upon successful completion employees will receive the American Red Cross Cardio Pulmonary Resuscitation (CPR) certificate, lifeguard certification, and first aid certificate, which is all valid for 2 years.